Get our content sent directly to you! Hurricane Harvey made his unwelcome arrival in Houston, TX on August 25. Homes all over the state are badly affected by the floods. With increasing dampness coupled with warm temperatures and secondary flooding issues, there’s an increased risk of infestations of toxic black mold in homes in our area. Unfortunately, mold in house thrives in this general atmosphere. In fact, it can grow within days. Mold growth after a hurricane is extremely common and extensive. Take for example in the case of Hurricane Katrina. Studies revealed extensive mold growth in New Orleans homes affected by the devastating storm, even in those that had only flooded part of the way. In the case of a terrible event such as Hurricane Harvey, be aware that levels of mold may sometimes continue to increase for as long as a year after this category of natural disaster. As the waters start to recede here in Houston, and we go back to our properties and businesses to evaluate the damage, it leaves us susceptible to the signs and symptoms of mold. In this post, we want to give you a heads up to the mold allergy symptoms and signs so you know what to look out for. First things first, what is mold? Mold is a fungus that grows in warm and wet conditions. There are thousands of different types of mold. In the U.S. today, there are approximately 1,000 known species. It’s dangerous for anyone to breathe in black mold spores, but it’s especially so if you have any type of lung condition or immune system problem. If you breathe in certain types of black mold, like Aspergillus fumigatus, for instance, the spores can grow in your lungs, cause pneumonia-like symptoms and are hard to treat. Symptoms of a mold allergy are very similar to those that occur in other upper respiratory allergies. Most of the time, they represent hay fever type of symptoms that aren’t serious — but they can make you downright miserable. Indications tend to vary depending on the person. Symptoms can range from mild to severe. You might feel your symptoms get worse when you’re in an enclosed place that has mold growth or if the weather is damp. Indoors, molds tend to cause you year-round symptoms if you’re sensitive. Outdoor mold can cause you to feel symptoms year round in some climates. Alternatively, you may only feel symptoms and signs of mold exposure in the spring, summer and fall. Bear in mind that mold allergies are common. They can show up immediately when you’re exposed to mold or can develop hours or days after your exposure. You can get an allergic reaction by either breathing in the spores or even by just touching them. Mold exposure has the potential to irritate your mucous membranes even if you’re not allergic to it. Who Might Be Especially Prone to a Mold Allergy? Asthma and COPD both cause chronic airway inflammation. The illness interferes with your breathing and a mold allergy can make your breathing worse if you have these conditions. If you have any of the above conditions, it’s crucial to limit your exposure to allergens as much as you possibly can. And if you have either of these conditions and have been exposed to mold, be sure to give us a call here at Houston ENT & Allergy. An over-sensitive immune system response triggers your mold allergy symptoms. When you inhale spores into your lungs, your body creates antibodies to fight these. Well after your initial exposure, your body still creates antibodies. These actively remember the mold spores so that the next time you come into contact with them, your immune system will go into overdrive. Your body then releases substances like histamine. It’s these substances that are responsible for the symptoms you then have. 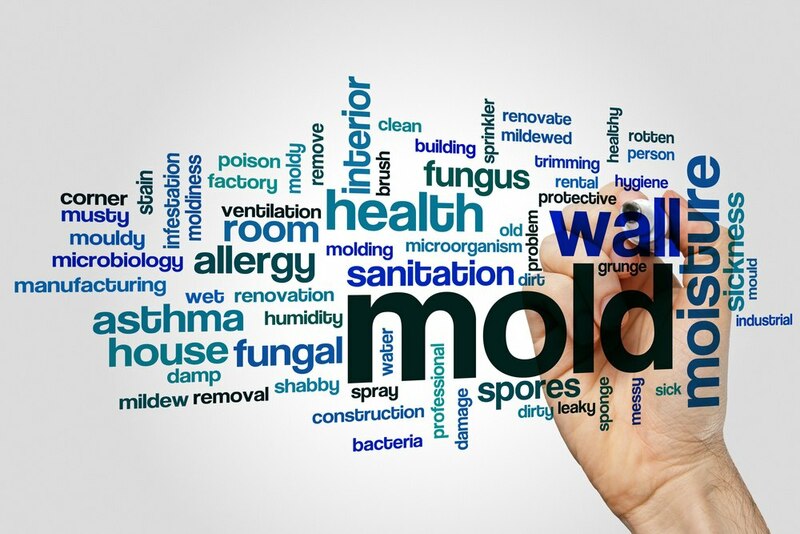 Molds that commonly cause allergies include Penicillium, Alternaria, Cladosporium and Aspergillus. Remember, just because you’re allergic to one type of mold, this doesn’t mean you’ll react to all molds. As many as one in three kids have a mold allergy. If your parent suffered from allergies, your chance of inheriting this specific allergy is around 30 to 40 percent, rising to 50 percent if both your parents suffered from allergies. Asthma that’s mold-induced. You need to be particularly careful around mold if you have asthma. You could potentially have a severe asthma attack when you’re exposed to certain mold spores. Symptoms of asthma include, shortness of breath, coughing, wheezing and chest tightness. Allergic bronchopulmonary aspergillosis. This rare condition is sometimes brought on by mold in the environment. If you’re affected, you present with an inflammatory as well as an allergic response to mold. You may suffer from asthma-like symptoms like shortness of breath and severe wheezing. This allergic reaction to fungus in your lungs can occur if you have cystic fibrosis or asthma. Allergic fungal sinusitis. Allergic fungal sinusitis is an inflammatory condition due to fungus in your sinus area. Hypersensitivity pneumonitis. Hypersensitivity pneumonitis is a rare condition. It’s caused by your lungs becoming inflamed by mold spores. There are other health risks posed by mold. Occasionally, it can cause mucous membrane or skin infections. However, this isn’t a real worry for anyone who’s in good health. Working a job that increases your mold exposure. If you work in a profession or job, such as winemaking, antiques, dairy work, logging and so on, you could have a problem if you’re allergic to mold. Having mold allergy in your family. If your family has a history of mold allergy, asthma or other allergies, you’re more likely to suffer from a mold allergy. Living or working in a place with bad ventilation. You need to have a good flow of air in your home or workplace. Be careful to ensure damp rooms like basements, bathrooms and kitchens are particularly well-ventilated. Having a house that’s very humid. The likelihood of mold growth in your home increases if your indoor air humidity is more than 50 percent. Also, if you're in contact with vast amounts of mold in your home, it can trigger an allergy. Living or working in a building that’s very damp or wet. Examples include the flood damage from Hurricane Harvey, leaking pipes and so on. When a building is wet or damp, mold can take it over. You need to remove the mold from your home as soon as you can. If you’re at all worried, ask for professional help. Always remember to wear personal protective equipment (PPE)whenever you come into contact with any spores. If you still find you have symptoms after the mold seems to have gone, you may need to visit us here at Houston ENT & Allergy. While nasal steroids and antihistamines are available to purchase without a prescription and may be helpful for mild mold allergy symptoms, if you have a serious underlying health condition or moderate to severe symptoms, it’s a good idea to talk to your doctor about your treatment options. Always wearing personal protective equipment. Whenever you could be potentially exposed to mold, always protect yourself out with protective gloves, an N-95 respirator and goggles. Avoiding potential fires and carbon monoxide poisoning. Always use portable generators with care, away and outside of your home. Making sure there are no more traces of mold. You need to ensure there’s no more mold before you go back to your home to live. Clean mold from hard surfaces with water and detergent. Then, dry the area thoroughly. Clean refrigerator drip pans regularly. Clean any leaks or spills in a timely manner. Open windows, use exhaust fans or dehumidifiers to keep moisture to a minimum. Ensure the outside of your home benefits from adequate drainage. With the recent floods, many Texans may find patches of mold growing in their homes. As you can see from the above, molds do have the potential to cause health issues. But, don’t panic. There’s plenty that you can do about mold growing in your home and about mold allergies. We hope that this article has been informative to you in your time of need. If you’ve developed symptoms of a mold allergy and wish to know more, contact us here at Houston ENT & Allergy today. ©2019 Houston ENT & Allergy - Do not copy. All rights reserved.